orn in 1951, Bruce Jackson grew up in farm country in the Pacific Northwest. His earlier professional life included farming, professional skiing, helicopter rappelling with the U.S. Forest Service and fishing in Alaska. A passion for skiing brought him to his present home of Bend, Oregon, in 1969. While working with ski cinematographer Warren Miller in the winter of 1976, Bruce became inspired by the creative process of photography and purchased his first professional 35mm camera that fall. In his own words, "I did not understand the source of my feelings; I just knew I felt passion and a deep need to express myself." As he had done with skiing, he immersed himself completely in photography. In the years that followed, Jackson explored his creative passion through the photographic process as his awe and respect for Nature deepened. Bruce's foundation of reverence for Nature was established early in his life having grown up surrounded by his mother's exquisite native plant gardens. His father's constant attention to detail helped shape Jackson's approach to the photographic process and it is clearly evident in his meticulously crafted work. Beginning in 1984 and continuing through the early 90's, Jackson published and marketed award winning fine art posters of his work while continuing to expand his artistic vision. 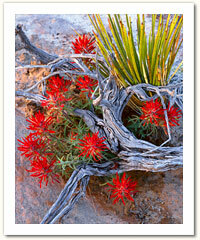 In 1992, he was awarded Grand Prize in the Sierra Club International Photography competition. Bruce's fine art images grace numerous corporate offices, organizations and private homes throughout North America. His images have been presented in Sierra Club publications, and as front covers including, the prestigious Coldwater Creek catalogs and Ritz-Carlton magazine. Drawing on years of experience in self publishing, Jackson expertly collaborates the print making of his large format 4x5 original transparencies. His commitment to perfection when creating and printing his original images produces Fuji Crystal Archival prints that 'glow with the vibrancy of life itself'. Today, Bruce travels extensively photographing America's most beautiful and evocative landscapes. His images reach levels of self-expression rare in the world of contemporary art. Bruce Jackson's masterful orchestration of composition, color and light creates images of purity, grace and beauty that embody the true spirit of Nature.